Caramelizing the lemon slices softens their acidity and makes them edible, peel and all. Eating them is optional, but highly recommended. The lemons’ tangy, slightly bitter flavor is a bright complement to the rich, salty prosciutto in this recipe. 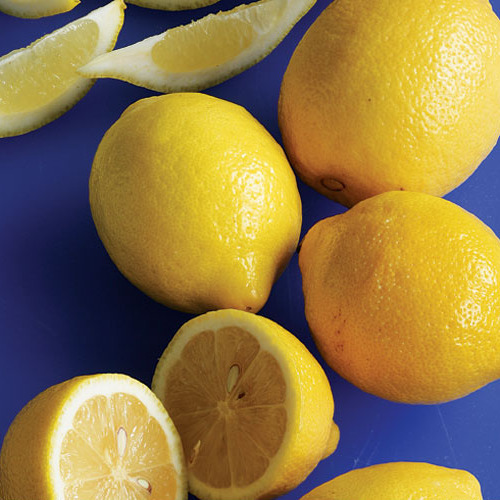 Trim a thick slice off each end of one of the lemons, and then cut 1/8-inch-thick slices from the lemon center—you need 12 slices, so you may need a second lemon. Juice the ends and enough of the remaining lemons to obtain 1/4 cup juice. Set the slices and juice aside. Heat the oven to 200°F. Set a heatproof serving platter and a baking sheet lined with a paper towel in the oven. Trim and cut the pork tenderloin into 6 thick medallions of roughly equal weight. Place a piece of plastic wrap on the countertop. Put one pork piece on top of the plastic with one cut side up and cover with a second piece of plastic wrap. With a meat mallet (or heavy skillet), pound the meat into 1/4-inch thick scaloppine. Repeat with the other pieces. Sprinkle both sides lightly with salt and pepper. Top each scaloppine with two to three sage leaves and then a prosciutto slice, folding any of the overlap underneath the pork scaloppine. Put the flour in a shallow bowl. Dredge the scaloppine in flour, shaking off the excess. In a 12-inch skillet, heat 1-1/2 Tbs. of the oil over medium-high heat. Cook three of the scaloppine, prosciutto side down first, until lightly browned and just cooked through, 1-1/2 to 2 min. per side. Transfer the scaloppine to the baking sheet in the oven. Add the remaining 1-1/2 Tbs. oil and repeat with the three remaining scaloppine. Transfer them to the baking sheet and keep warm in the oven. Remove the pan from the heat and pour off any remaining oil. Add 1 Tbs. of the butter and let it melt. Add the lemon slices to the pan in a single layer. Return to medium heat and cook the lemon slices until lightly browned on one side, 2 to 4 min. Turn the lemon slices and add 2 tablespoons of the vermouth to the pan. Continue to cook until the vermouth cooks down to a glaze, 2 to 3 min. (The lemon slices will resemble bicycle wheels, with much of the flesh going into the sauce.) 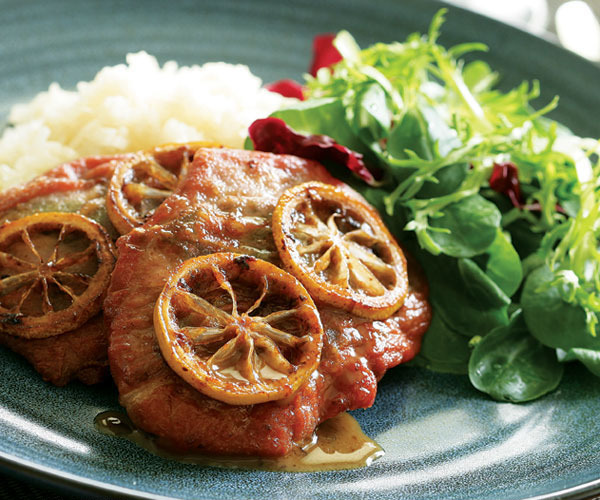 Transfer the lemon slices to the scaloppine in the oven, placing two slices on each one. Pour the remaining (approximately 3 Tbs. ) vermouth into the pan, bring to a boil over medium-high heat, and deglaze the pan by scraping up the browned bits from the bottom. Add the chicken broth and lemon juice and boil until reduced to 1/4 cup, 3 to 5 min. Remove from the heat and stir in the remaining 1 Tbs. butter. Taste the sauce for seasoning; if it’s too acidic, add a touch more vermouth to the pan. Transfer the scaloppine to the serving platter, spoon the sauce over, and serve immediately. Serve with salad and Sour Cream & Leek Mashed Potatoes. Excellent!! I didn't have vermouth so I used Sherry. Easy, fast, elegant!!! This dish was delicious! I used pancetta instead of prosciutto since thats what I had on hand. I miss-read the directions and rolled the pancetta and sage in the scaloppine instead of wrapping. It worked perfectly but next time I will definitely make as directed since it makes such a pretty presentation. The sauce is incredible and so easy.